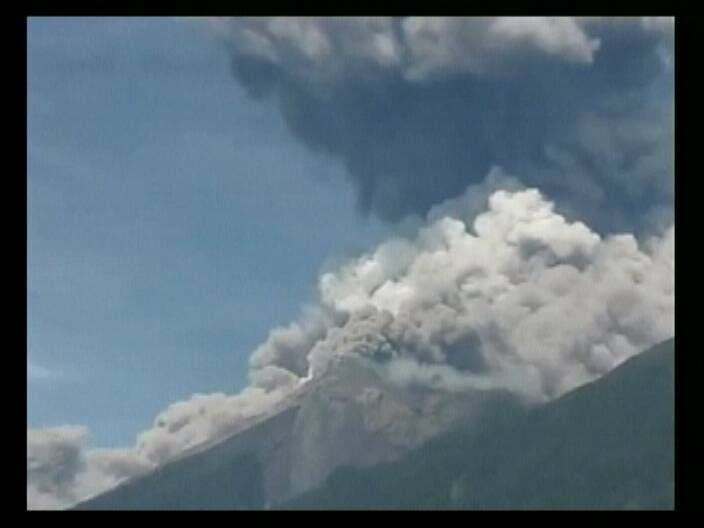 A massive volcano eruption has forced the evacuation of over thirty-three thousand residents in seventeen villages, ten miles from Antigua in neighboring Guatemala. Antigua is a main tourist center where many Belizeans visit on a regular basis. This morning, the active “Volcan de Fuego”, which is over twelve thousand feet high, spewed lava nearly two thousand feet down the slopes and the smoke could be seen from up to forty miles away. According to reports, it is the largest eruption in decades. In news reports this afternoon, it was estimated that the eruption could continue for at least another twelve hours and the Red Cross has set up ten emergency response centers. The Volcan de Fuego is one of Central America’s most active volcanoes and is joined with another volcano, called Acatenango; the complex is known as La Horqueta. I visited “Volcan de Fuego” eight years ago. It was awesome to stand twelve thousand feet high and to look over into that black hole, the whole time holding your breath from the smoke. Wow , must be a hot thing there. But so dangerous too. Volcanoes, the gift that keeps on giving. They are fascinating and magnificent to see, but they can be pretty hard on the people who live near them! Kristy Dawson is missing; have you seen her?